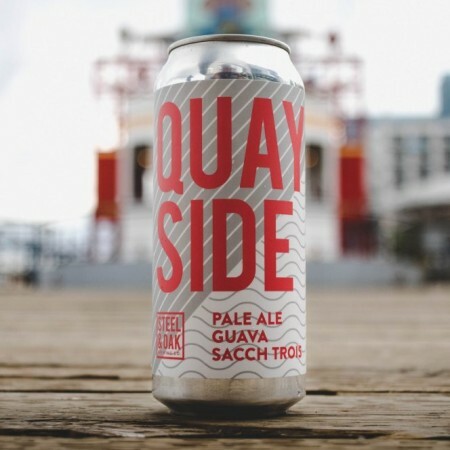 NEW WESTMINSTER, BC – Steel & Oak Brewing has announced the release of a limited edition beer that was partly inspired by its brewer’s love of a certain tropical fruit. Eric our brewer really loves guava. So much so if I didn’t say anything we’d just be a guava based brewery in New West. Guava Hefeweizen, Guava Lager, Guava Honey Doppelbock, etc… Surprisingly this is the first beer we’ve released with guava in it! Quayside is made with Pilsner, Oat, and Wheat malt, so it pours cloudy, we conditioned it on guava and let the Sacch Trois yeast ferment it out a bit so that it has refreshing tropical notes but finishes crisp and dry with a touch of funk. Quayside is available now in a limited run of tall cans exclusively at the Steel & Oak taproom and retail store.